1. Who the heck am I? I'm LKP to friends: an eternal optimist, a fun-loving gal who believes happiness is a choice. I'm living my dream by living and working in NYC (moved here nearly 8 years ago and never regretted it!) I love the way food brings people together; some of my family's most revealing moments were across the dinner table. I have many memories of how my mother put together a big meal that could bring remarkably different people together. I have met people from all over the world at the dinner table--we might speak different languages, have different faiths, but we've all gotta eat! 2. 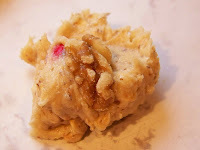 What makes me 'qualified' to blog about food? Absolutely nothing, really. I have no credentials, I know that taking a course or two in food does not a master make. However, I am not claiming to be the next James Beard or Julia Child. I'm just a person who loves food, loves the social element of it, and loves experimenting. I was the food nerd in college who was sautéing her rice in olive oil and garlic before cooking it, and making simple sauces for chicken breasts. It seemed fancy to others, but it was just the same old simple stuff I grew up eating. I'm not trying to be anything other than I am. I consider myself a 'foodie' because I love food, I love trying new flavors, and I love sharing those experiences with others. That's it in a nutshell. 3. Cooking's really NOT that hard. Most of my friends protest that they don't know how to, could never learn, etc. Hey, if you're not interested, that's totally cool. It's not for everyone. But if you're someone who WANTS to learn how to cook, I hope some of my recipes encourage you to do just that. I still remember how elated I was to make my mom's famous pastry shells (for éclairs, of course) all by myself, or the first time I made Chicken Tarragon and NAILED it. It's empowering, and it's fun. It's also usually healthier. And even when it's not, it's worth it. ;) There's also something so satisfying about cooking for other people and sharing your food with them-it's connecting on a basic level, and I love it. You don't have to make Beef Wellington or Baked Alaska...start simple, have fun, and enjoy tasting along the way! 4.I'd also love it if you'd vote for me by clicking on the Food Buzz icon on the upper righthand corner! 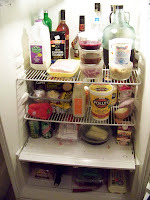 I first saw the Foodbuzz label on Feisty Foodie's site, and was quickly working to get involved myself. 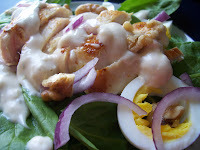 My dear friend Sara is also a Foodbuzz Friend...check her out, too! 5. Got a favorite recipe you'd like to share? Email it to me at Lkparker@aol.com. 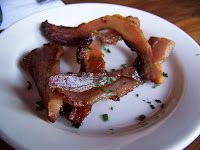 Feel free to leave any comments or suggestions, or share your recent culinary outing! Thanks for reading, and Happy Eating! It's been a while since I went out for drinks with friends. In fact, I think the last trip out was with Blonde Beth, to the Australian! My friend Holly P suggested last week that we get together THIS week, and she proposed a place so cheap that even *I* could swing it! 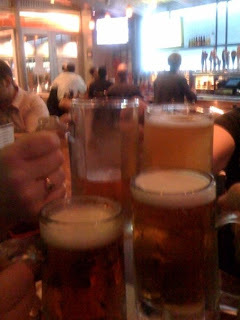 123, Burger Shot, Beer is a place known for its 1-dollar burgers, 2-dollar shots, and 3-dollar beers. I'd been LAST summer with Holly P for a coworker's goodbye party (3 jobs ago! ), and it was crammed with so many people, we waited almost an hour for our burgers, and it was just a big night o' chaos. However, the prices cannot be ignored, so we went back last night. 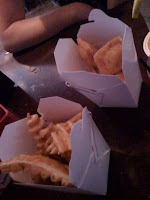 We also ordered some waffle fries and eventually regular fries: stick with the waffles. They're seasoned, but not overly so. 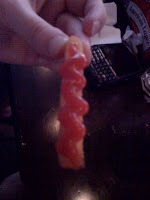 The fries were a little too meh for me. The outside is super crispy and the inside is a little airy--some folks might love these, but I prefer the meatier, tastier waffle fries. 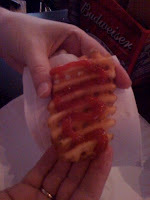 And yes, I prefer to put ketchup on each individual fry as I eat it, ESPECIALLY if the ketchup comes in a squeeze bottle! My friend Blonde Beth also ordered the fried ravioli, which was okay (breading is a little thick), but it would have been much better with some marinara sauce, which this place does not offer. Le sigh. One of the best things about this place is how empty it was at 6pm on a weeknight! We had no problem getting a table (though my legs are a little too short to dangle comfortably--I wish they had a little ledge where I could have rested my toes--I was shifting uncomfortably all night!) 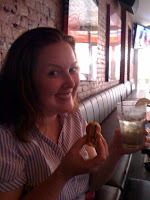 But THE best part was getting to catch up with my friends--as Holly P says, "Burger: 1 dollar. Shot: 2 dollars. Beer: 3 dollars. Catching up with friends: Priceless." 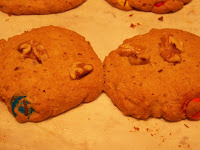 This weekend the BF & I decided to experiment with cookies. I learned that the BF has long been legendary for his chocolate chip cookies. He has the Tollhouse recipe memorized (I still have to look at the bag), and he is not afraid to tinker with it! He had some almond meal he picked up at Trader Joe's, and we decided to mess around with ratios (fractions! I'm doing math and I'm liking it!) 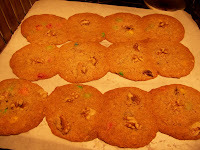 and even add some oatmeal...along with some M & Ms...and maybe some walnuts (I also have my BF to thank for my new appreciation for walnuts--they're wonderful on just about anything!) Yum. 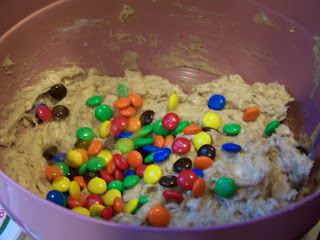 Our latest experiment was a success--except for the fact that I forgot to bring home some cookies with me! Looks delicious, no? 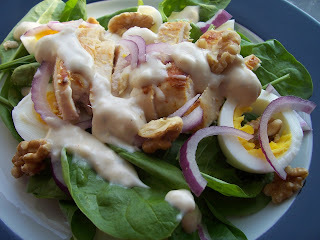 Baby spinach, seared chicken breast, slivers of red onion, hard-boiled egg, bleu cheese dressing, and a smattering of walnuts. It tasted okay..but it was missing something. Something I forgot until I returned to the kitchen with my empty plate and saw the slice of crispy (lower-sodium) bacon I cooked 30 minutes earlier, AKA the entire reason for the salad in the first place!!!!!!!! One of my favorite things about my BF (and I have many) is that he is an excellent cook. He's not a paint-by-numbers cook (as I can tend to be--order brings me comfort). 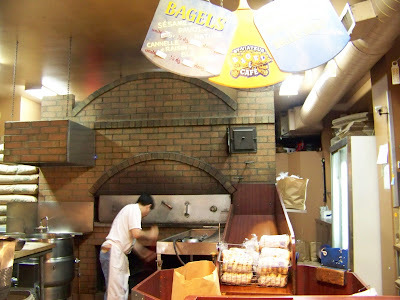 He makes some of the best omelets, breakfast sandwiches, tzatziki (etc, etc) I've ever eaten. 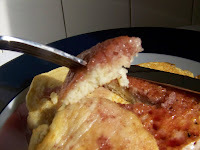 I so enjoy trying out new and old recipes with him in the kitchen. He makes me take a few more chances, and that's always a good thing. We always have a good time, joking around, maneuvering around each other (space in my kitchen is a little more limited than in his), taste-testing our creations along the way. This weekend he made his world-famous omelets. He never skimps on the olive oil (something I'm still fairly conservative with when cooking), and his eggs turn out fluffy and delicious every time. He credits Cooks Illustrated (LOVE!) with this technique. He added some yellow onion and red pepper, and sprinkled the leftover veggies on top. 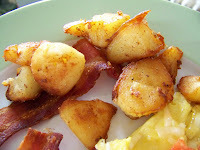 I made pan-crisped potatoes, a recipe that never fails to wow. 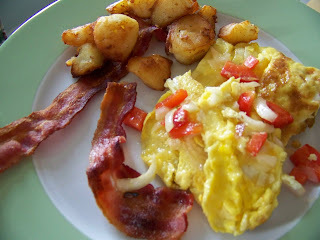 I used leftover red bliss potatoes from dinner the night before (recession recipe alert!!) You HAVE to try these. They're a dish of simple ingredients with an impressive end result: 5-10 minutes in 1/4 inch of olive oil, some salt, black pepper, and a dash of garlic at the end leads to the most delectable morsels of potato. While I almost forgot the garlic, I recovered in time. The VERY best part of this dish? I sliced some shallots horizontally, making little rings, and fried them. 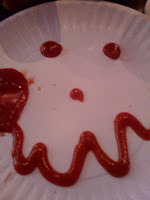 To quote my friend Sara, NOMNOMNOMNOMNOM!!!! We were ooh-ing and ahh-ing over this awesome breakfast spread in no time, and it costs next to nothing! Park Slope's 5th Avenue is practically bursting with delicious eating options. One of my favorites is Lobo. I believe there are a few other locations, but this is the only one I've visited. They're known for 'Tex-Mex,' and having lived (and eaten a LOT) in Texas, I will tell you it's Tex-Mex with some poetic (cooking) license. Their food is good, it's just a little off from what it really tastes like in Texas (and oh dear, does it taste good in TX). The pictures in this post are from a visit to Lobo a few months ago (pre-money crackdown) with my friend Laura, who started a 'Brooklyn Brunch' tradition with me a few years ago (a tradition that's been on hold as of late, naturally). 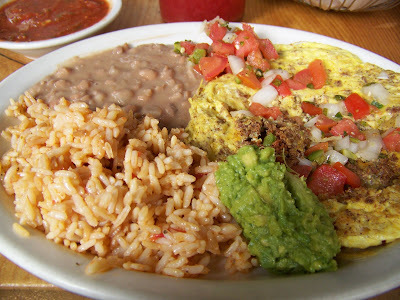 I usually get their Huevos Rancheros (I think I've mentioned a time or 12 that I love that dish). You can add just about anything to them, and in this case I chose the chorizo. It wasn't as spicy as I was hoping for, but I still ate every bite. They're good. Not spectacular, but good. It goes nicely with their salsa, which is so packed with pepper (black pepper, not the veggie, so it has a smaller chance of taking out my dear friend Sara) that sometimes it takes me by surprise. What keeps me coming back, however, are their margaritas (which qualify as their own food group in my life). A particular favorite of mine is their Sangre de Lobo (wolf's blood..sounds better in Spanish, no?) It's made with a cinnamon-infused tequila that is YUMMMMMMMMMMMMMMMMM. 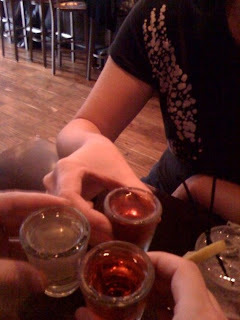 I also love their jalapeno-infused tequila. 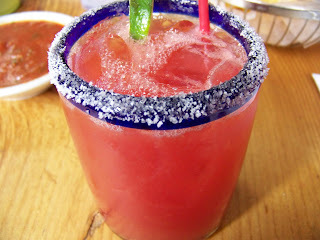 The sangre margarita is a little sweet, but sometimes that's exactly what I want. The pepper-infused tequila is awesome--tart and smoky and a slowly-building heat that really bounces off the coolness of the liquid. As I've mentioned before, money is especially tight these days, as I am staff, but part-time, so my hours hover around 20 instead of 40. Ouch. But I have a job, and that's what I hold highest in my mind. I've narrowed my allowable expenses down to the following: food and rent. Yep, that's pretty much it. But it also means I have to be very careful with what I buy for food. I can't afford to waste money on produce that gets tossed, or seafood that goes bad, or any other wasteful habit I may have exhibited in the past. It's also making me really reflect and learn to appreciate what I do have, and what I do eat. I'm trying to stick to whole foods, avoiding processed or refined stuff. I was never that big on it anyway, but there have certainly been times where I've reached for a boxed something or other when I could just have easily made it myself. And now I am doing just that. Believe it or not, I'm saving a lot of money making my own food and buying only what I need at the moment. And while I've always been more of a cook at home than eat out person, now I have to be, and that is a bit confining at times. It sometimes makes me want to rebel just for the sake of rebelling...but that thought quickly passes when I see my bank balance. I really chafed at this in the beginning. Actually, I panicked, even if it didn't always show on the outside. In a flash, it brought back unpleasant memories of a very cash-strapped childhood/adolescence, when there was money for food, but just barely, and for housing, but not always, and it just didn't look like it was ever going to get better. In my single-parent household, money was never abundant. The memory of that kind of insecurity never completely leaves, but I'm working to remove some of the emotional triggers outta my psyche! My mom made everything from scratch because it was cheaper. It was actually cheaper to make a batch of biscuits at home with eggs and tea than to go out, tip a server, etc. And my mother taught me that if you couldn't afford to leave a generous tip, you couldn't afford to go out. It wasn't until I was much older that I began to realize home cooking was often a lot tastier, too, and that our family actually had a lot of fun during many of those meals. Back to the present: after a few days of panicking, blinking back tears, and harriedly trying to figure a way out, I reminded myself that I'm NOT back where my family used to be. While it may feel oddly reminiscent (which bill do I pay right now? Which ones get pushed back a little?) of earlier years, I know it will get better. I am embracing this time because it's here, because that's how I tend to run: find the positive side. So I'm taking pleasure in the food I have and the fact that I can feed myself and do it well. 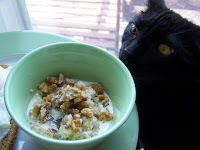 Something as mundane and everyday as poached eggs and oatmeal can be sublime if you approach it right (that's Mitzi sniffing her approval). I've become obsessed with walnuts as of late. The fact that they're a great source of Omega-3 fats is just a bonus. 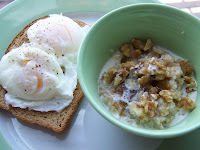 I take my McCann's Irish Oatmeal and mix in some honey, chopped walnuts, cinnamon, and a splash of half-and-half, and I have a truly delicious meal with a terrific range of textures. Pair it with some poached eggs on toast with freshly-cracked black pepper and you have one truly happy food blogger. The simple flavors somehow elevate as I appreciate and savor each bite. It might sound a bit corny, but it's absolutely where my head and heart are right now. 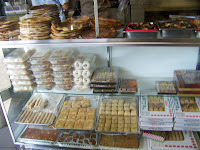 Just steps from my building is a delicious and affordable Lebanese restaurant. 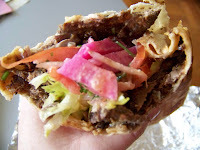 I've been numerous times since I moved to Bay Ridge, and I always get the same thing: beef shawarma sandwich. It's spicy, tangy, yet slightly-sweet meat packed into a flatbread with lettuce, tomato, a zingy sauce, and various as-yet unidentified veggies (which happen to be almost as delicious as the meat!) I also figured today was a good time to ask the man behind the counter (who's always just lovely to me) what those 'pickled veggies' are. Imagine my surprise when he said "Turnips." My jaw actually dropped, because I have said flat-out, for the record, in public and in private, that I hate turnips. Don't like them, don't want them, don't want to try to like them. Blech. 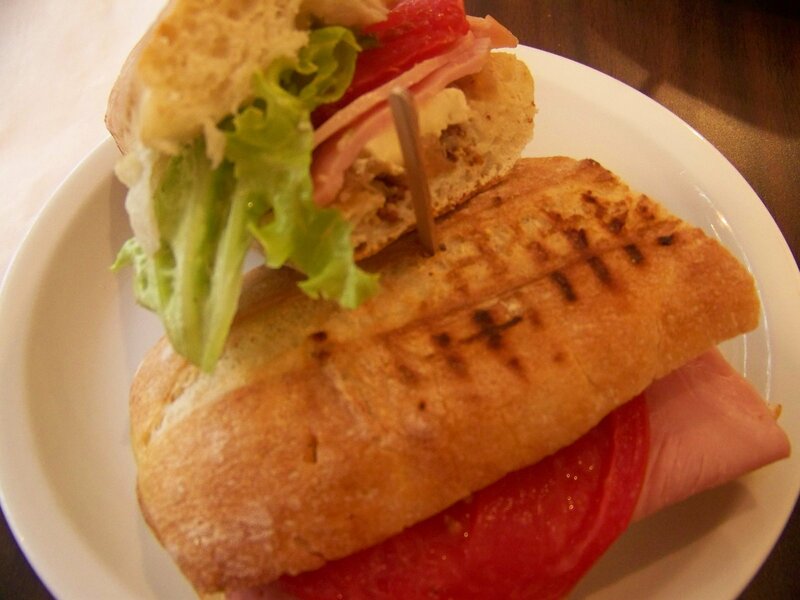 And yet, in this sandwich, I LOVE them! The turnips are the bright pink strips. I am assuming they're colored with beet juice or something? Another question for another time. And in my curiousity, I tried one of the turnips on its own, but found it had a bitter tinge to it (another reason why I hate turnips). Yet when you eat it WITH the sandwich, that bitterness disappears. Genius. 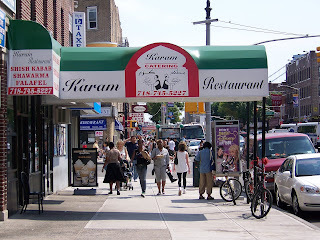 Karam is also known for their rosewater lemonade, which I can't quite decide if I like. I am not a fan of rose 'flavor.' Rose flowers? Love 'em. Rose-flavored foods? liquids? They always have a soapy taste to me. 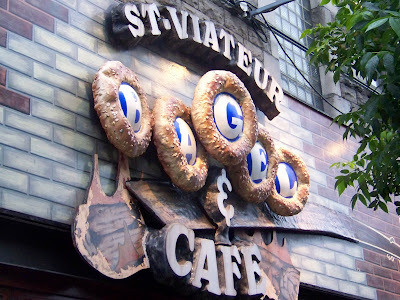 I haven't really tried any of their pastries yet, either. I'm always focused on the sammich. I've never been able to finish one of these monsters, and today was no exception. 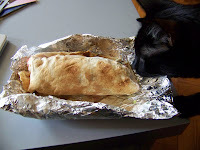 Notice my boy cat, Oliver, taking a tentative sniff and offering to 'help' me with my sandwich. I declined his generous offer. Then his sister, the inimitable Mitzi May, decided to sit guard to my left, just in case I changed my mind. I did not. Thanks for the offers, kids, but I wasn't about to share this sandwich with anyone. Yet despite being super-hungry (I ate breakfast at 8am and it was now 330pm), I could only finish half of it. Defeated sigh. I still haven't posted half of what we ate/tried in Montréal--funny how present-day life just gets in the way sometimes. 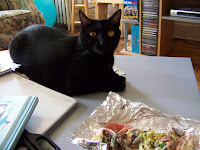 But this one particular meal will not be forced to the back of the 'to blog' posts; it will not let me relegate it to a dusty pile of fading memories. It will be recognized! 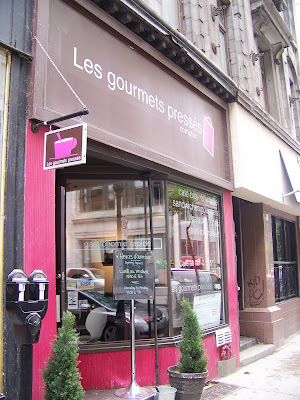 Our last stop in Montréal was also one of our best. Before the BF and I hopped on our rented bicycles, we wisely decided to fuel up with an early lunch. 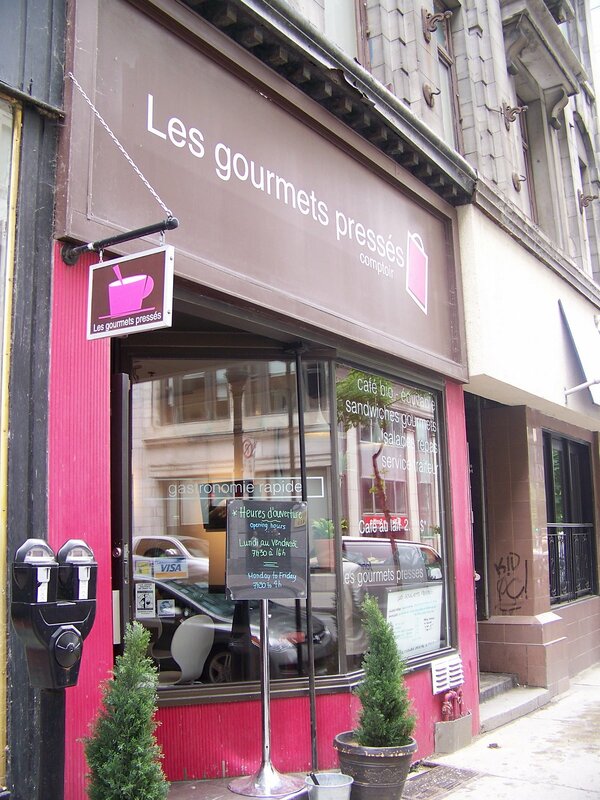 We walked just a few steps from our hotel to les gourmet pressés (touting their gourmet pressed sandwiches). I'd seen a few of these around the city, but never stepped inside. I am oh-so-glad we did. I'm happy to report that this trip also gave the BF a new appreciation for well-crafted espresso. 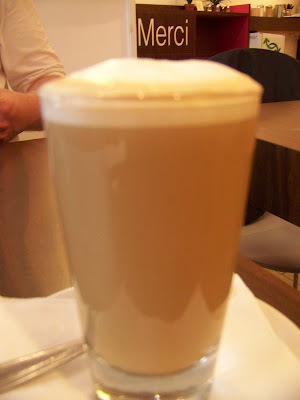 I had at least one café au lait a day, and every time I ordered one, the BF would sample it and inevitably go back and order one for himself. Like this one. 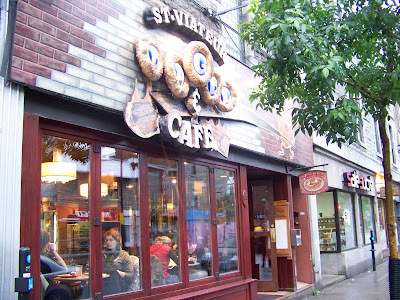 We also had lovely service--they bring the food to your table, and the young man behind the counter helped us in both English and French. He was polite, friendly, and a pleasure to meet. 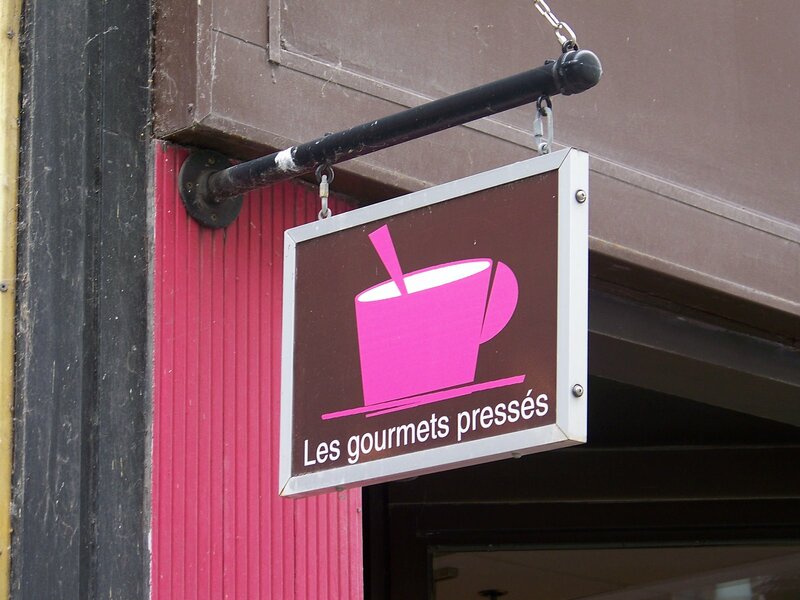 Highly recommended if you're ever in Montréal--especially the location on St. Jacques Street! My fab friend (and NY Native) CPZ lives in the East Village. Thanks to her, I've become more familiar with an area of town I would rarely visit otherwise. 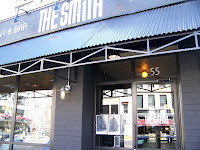 One cool day, she invited me to join her at a (then just-opening) restaurant called The Smith. They bring tap water (sparkling? 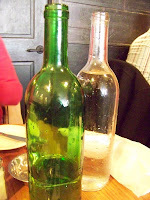 please) to your table in colorful tall glass bottles, which means no hunting for a server when you've downed your first glass of H20 (it also must save the staff lots of time since they don't have to run all over, refilling individual glasses!) 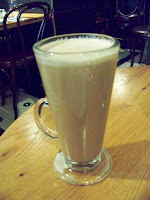 I also ordered a café au lait, as I desperately needed a caffeine boost that morning. 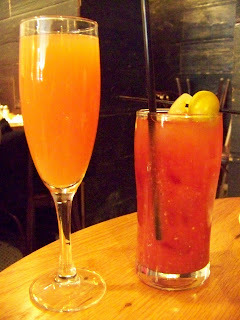 Brunch, God bless 'em, comes with a complimentary drink. I can't remember what CPZ ordered, but I ordered the blood orange Mimosa, which was bursting with fruit flavor, but not sicky-sweet. If I remember correctly, CPZ got the passion punch. 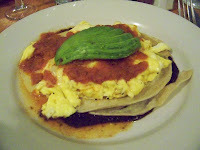 My entrée was a variation on a favorite of mine: huevos rancheros. The Smith's version is called "Ranchero Scrambled," and featured chipotle (fave!) salsa, black beans, cheddar cheese, tortillas & avocado with scrambled eggs on top. 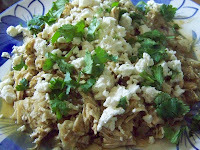 This dish was great--not the knock-out that Norma's offers, but hey, still pretty good. The presentation was nice, and the dish was bright and flavorful. Our dishes were around 14 each (including the free drink), so while not rock-bottom cheap, it was hardly a splurge. I would definitely go back there, though it seems to have gotten a lot of press lately, making me wonder if there's more of a line! At a cost of mere pennies a serving, this DEFINITELY qualifies as a recession recipe. 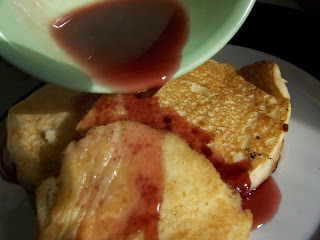 I used this recipe and had a batch of springy, fluffy pancakes in no time. 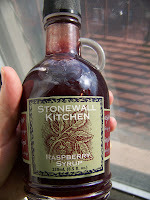 I'm no barbarian, so of course I warmed up the syrup as well. I poured a Texas-sized glass of ice cold milk, cued up this week's "Burn Notice" on my DVR, and had a damn tasty evening. Cheers! 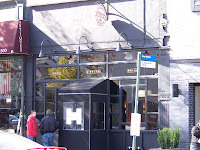 A few months back, my friend Kel & I hit up a Park-Slope area restaurant called Sidecar. I love my friend Kel--she will try just about anything once, and she has a metabolism to die for. We had a 20-minute wait or so on a busy Sunday afternoon before getting our own roomy booth. 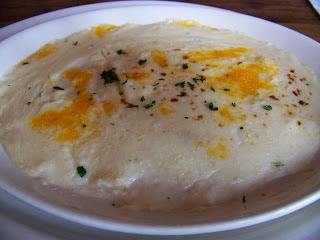 We started with one of the house specialties, the cheese grits. I am NOT a fan of grits. 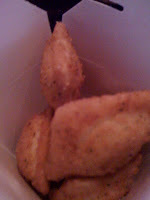 I don't 'get' them, but the few times I've enjoyed them, cheese and/or jalapenos have been involved. These grits were creamy, smooth, and surprisingly scrumptious. The presentation is deceiving, however; it's really a very thin layer, not even 1/4 of an inch deep, on a long dish. A little goes a long way, though, so it's really all you need. I might not necessarily order these on my own, but I'm glad I tried them. 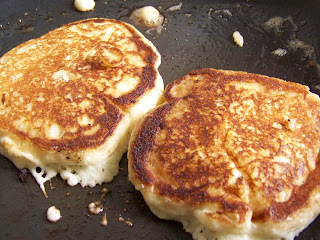 If you like grits, you'll probably adore these! 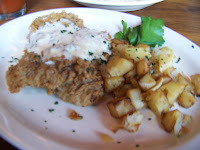 Another must-order: the chicken-fried steak. 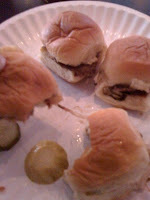 It's not as good as the CFS at Live Bait (in the Flatiron district), but it was pretty darn good for Yankee cooks. 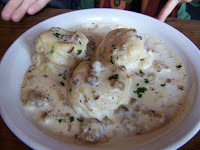 Living in OK and TX, I have been wooed by many a white gravy (please, let's just not think about how it's made). This was a decent go...accompanied by..... biscuits and gravy! 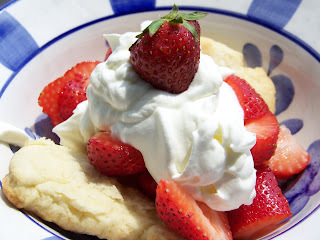 I would have liked a little more flavor with this dish--the biscuits were a little bit spongy and there was probably not enough good old American lard in it. Darn the Midwest for tainting my Yankee tastebuds! If you're going to skip a dish, I'd recommend this one. I actually prefer the cheese grits over the biscuits and gravy. The best part of this experience, hands down, was the dessert. You wouldn't think something as simple-sounding as chocolate pudding was worth raving about, but you'd be wrong. I was wrong. I was so very, deliciously wrong. 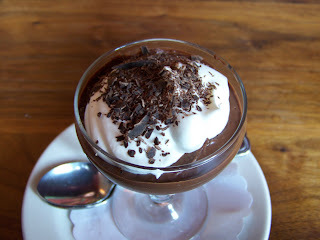 They must use seriously high-grade chocolate in this pudding: it's dark, rich, creamy, velvety, and I simply didn't want it to end. I would walk back just for this pudding..and this time I wouldn't share. Love in a cup. Yum. One of the 'must-taste' stops on our trip to Montréal was St. Viateur Bagels. They've been making their own signature bagels for more than 50 years. I'd heard enough about it from Food Network peeps and travel articles to know I had to hit this spot. After the BF & I visited McGill's campus, we took a train ride up to the location on Mont-Royal. It was a day full of on-and-off downpours, so the location was sadly not at all busy. Which was fine for us; we had no problem getting a seat. It just didn't have the same busy vibe I expected from all the TV and other media coverage I'd seen. But it's really about the food, isn't it? While I did enjoy all the chances I had to speak French, it was just as easy to find people who speak English, as did our server. 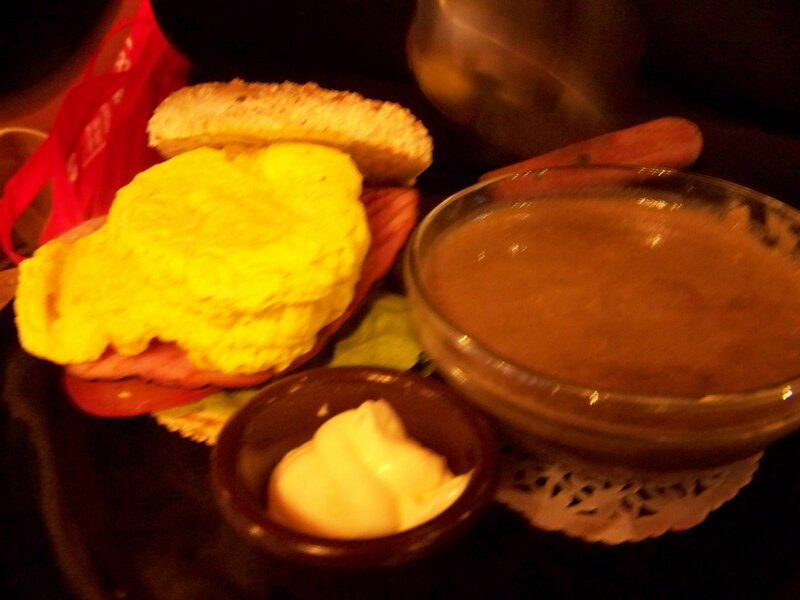 I wasn't that hungry at the time, but the BF (thinking wisely, I'd later realize in hindsight) ordered a sliced turkey sandwich with the soup du jour, cream of mushroom. I ordered a toasted bagel with strawberry cream cheese. We asked for poppy seed (in English & French), but we both got sesame (NOT my favorite by a long shot). I managed to pick a good number off of my bagel (discreetly, bien sur) and decided to go with it. You might notice I have an entire bagel PLUS one half, which I generously shared with the BF. The cream cheese was nothing special--it tasted rather..packaged, I thought. I found out later it's Kraft cream cheese spread! FAIL. 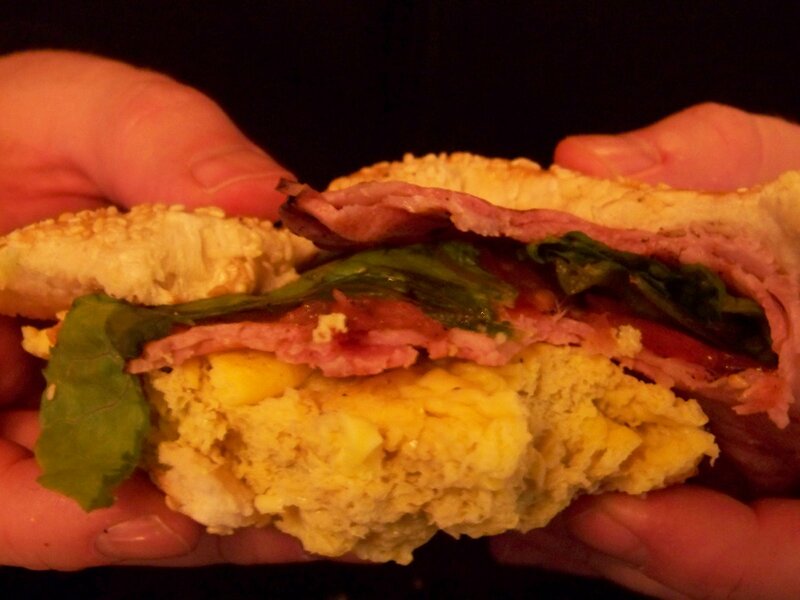 The bagel, however...I guarantee this isn't like any bagel you've had in the US. They are smaller, chewier, and softer. It's a completely different texture than the US bagels (and I've yet to find a bagel anywhere in the US that tops NYC bagels...maybe it's the water). While I enjoy American bagels, they can often be heavy, dense, and unwieldy, often large enough to stand in for 4-6 servings of bread. 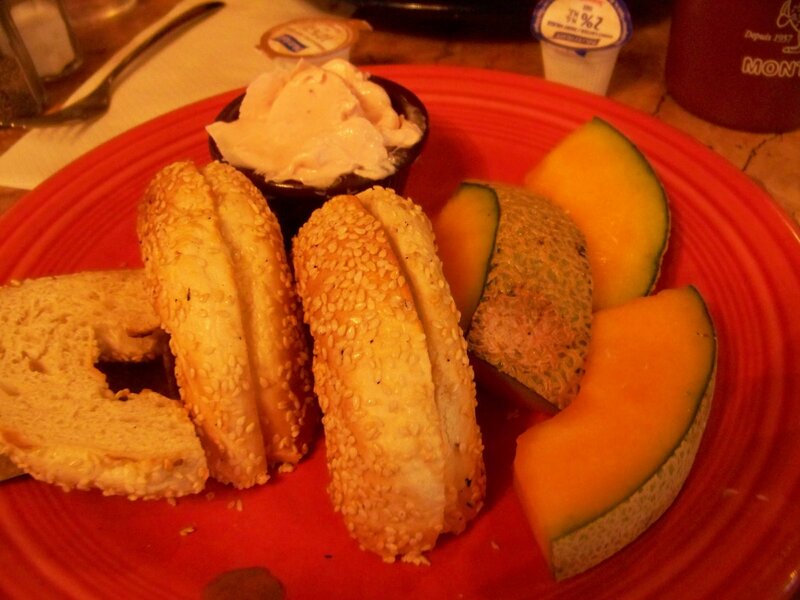 These bagels are much more subdued. They have a crunchy exterior and a soft, pillowy interior. As delicious as they were, however, I would still say I prefer American-style. These just come in at an extremely-close second place. I was pleasantly surprised at how tasty they were, and quite sorry I didn't follow in the BF's foosteps and order the delicious sandwich. Maybe next time. 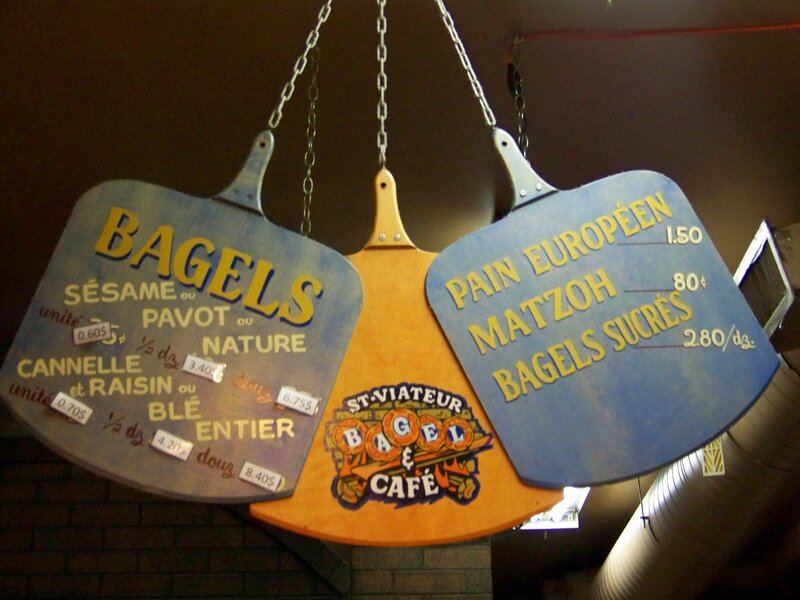 :) If you're in Montréal (which I recommend visiting), definitely stop by and try a bagel.